ReplaceAIR designed this “Louvered” unit to sit by itself or more often used in “Walk in Booths”. The louvered section is quick and easy to remove for easy access to the accumulated sludge. At ReplaceAIR, our Engineers are always thinking of ways to offer designs that meet specific industry requirements and scenarios. Our aim is to provide cost-effective and efficient control of Aluminum Explosive Metal Dust, Titanium Explosive Metal Dust or Magnesium Explosive Metal Dust. Total compliance with NPFA 484 regulations is a requirement for 90% of our finished equipment. 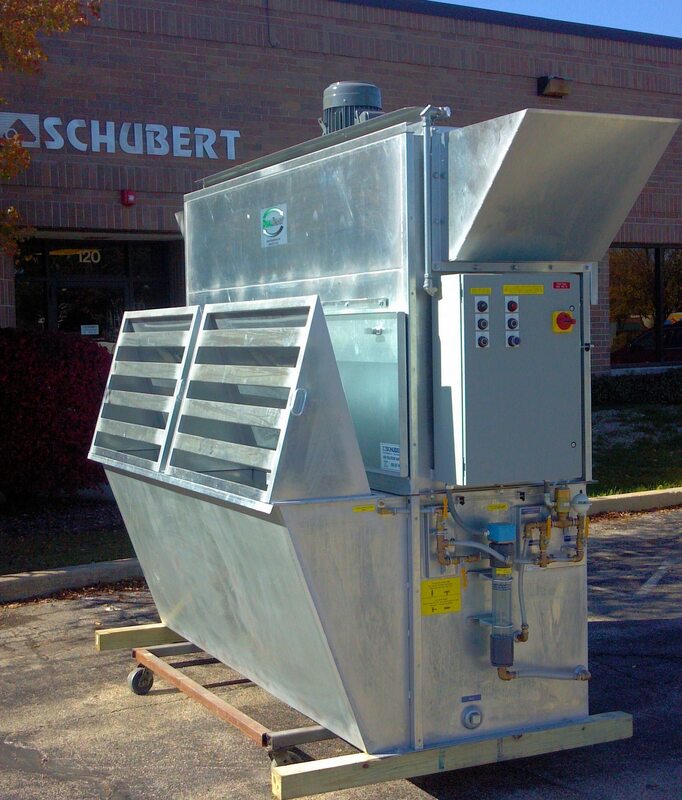 ReplaceAIR Side Draft Wet Collectors are designed for aluminum dust, titanium dust and magnesium dust and to meet NFPA 484 for Explosive Metal Dusts. This high efficiency impeller type Wet Dust Collector in stainless steel represents a long lived, economical Wet Collector at a low cost with its manual water level and clean out. Galvanized or painted steel options are available. WET COLLECTORS can be used for High Spark Generation Operations, where Media Dry Collectors will catch fire. These do not have to be NFPA 484 rated, but it is standard with all HydroAIR tables. The Automatic Electronic Water Level Control by ReplaceAIR is a feature that represents the Industry’s “latest design” with the 4 probe sensors and multiple alert features. Required for Magnesium is the 24-7 powered vent design. Another option for HydroAIR water level control is the Photo Helic Level control for automatic control at an economical price. We have manufactured many variations on this design including a floor level side draft option that slides over a standard Table that provides efficient dust capture at low to the slab applications. For more information on our products, please contact us via our web form or give us a call at 630-307-9400. ReaplaceAIR offers the HydroAIR Side Draft Wet Collector, perfect for aluminum and combustible dust collection within industrial areas. To learn more about our company and the products and services we provide, we encourage you to contact us today! As a nationwide distributor of environmental equipment, dust collectors, and wet dust collectors, we promise to keep your facility clean, safe, and operational when you partner with us for your industrial cleaning needs!